Record signing and top goalscorer Chris Wood has given Burnley a welcome boost ahead of Saturday’s home clash with Southampton. The New Zealand international skipper is available after a two-month absence, having come through a 70-minute run out behind closed doors on Tuesday. Wood has sat out nine games after suffering a medial knee ligament injury against Spurs at Turf Moor. But he is fit and ready to return against the Saints, as Burnley look to end a 10-game run without a Premier League win. Captain Tom Heaton also played 90 minutes at the Barnfield Training Centre in the 1-1 draw with Blackpool on Tuesday – after conceding a penalty inside 60 seconds – as he returned after five months out with a dislocated shoulder. Midfielder Dean Marney completed the game, while left back Stephen Ward, striker Nahki Wells and wideman Georges-Kevin Nkoudou also featured as they got valuable game time. Boss Sean Dyche said yesterday morning: “Stephen Ward got another game and Chris Wood got 70 minutes and came through well. “I spoke to him after and he was fine. “He’s certainly back in the thinking. “With no game last week, he managed to get all the training days in and there is no hesitation in him. Despite his absence, Wood remains top scorer with five goals in all competitions. 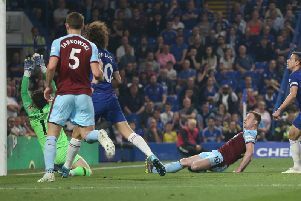 But the side have failed to win in those two months without him, and, asked if he has been a big miss, Dyche said: “We miss all the players, to be fair, that competitive element within the squad. “We’re on a tough run of results, and we want more players available to start or come off the bench. “We’ve been arguably as stretched as we’ve been and want as many options as we can. “We want to play strong and finish the season strong. James Tarkowski, who has missed six of the last 10 games through suspension and injury, remains a doubt with a groin injury, while Scott Arfield has a calf niggle: “Tarky is back in full training now but is unlikely for Saturday. “And Scotty has a tight calf and is touch and go. Heaton, however, will need more game time as he steps up his return: “Tom had his first game, which is good news. “He’s doing great, he’s trained for a number of weeks now, but it’s common sense that he needs more games for his own sharpness, to get his eye in.